There currently is no way of predicting which newborns will die from SIDS. There are, however, many things that parents can do to reduce the risk of SIDS. Experts have developed a number of practices based on research results. Following these guidelines will give your baby the best chance to thrive. Back Sleeping: Placing babies on their backs to sleep are the single most important step that parents and other caregivers can take to reduce the risk of SIDS. It is important to note that the side sleeping position is not a safe alternative. Babies that roll from their side to their tummy are 18 times more likely to die of SIDS. 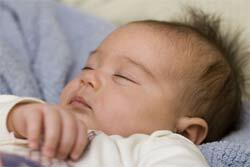 Bedding: Parents should make sure their baby sleeps on a firm, flat mattress in a crib that meets current safety standards. Avoid using soft, fluffy or loose bedding or other objects in the crib. Baby should wear a sleeper or other sleep clothing rather than using blankets other covering. Head Covering: Make sure your baby’s head remains uncovered during sleep. Avoid using a blanket or other covering over your baby’s face as a sun or weather screen, or to block out distractions or sounds while your baby is sleeping. Bed Sharing/Sofa Sharing: Do not share any sleep surface with your baby. It’s ok to bring baby into bed to feed and cuddle, put place them in a separate, safe sleep area alongside your bed when its time to go to sleep. For parents with babies at risk for SIDS, sleep safety measures are key. Pacifiers: Recent research has shown that pacifiers can significantly reduce a baby’s risk for SIDS. Experts recommend providing your baby with a pacifier EVERY time they are placed down to sleep. Smoking: Mothers who smoke during pregnancy are three times more likely to have a SIDS baby, and exposure to passive smoke from smoking by mothers, fathers, and others around the baby after its born doubles their risk of SIDS. Parents should be sure to keep their babies in a smoke-free environment. Room Temperature: Babies should be kept warm, but they should not be allowed to get too warm. An overheated baby is more likely to go into a deep sleep from which it may be hard to wake up. Keep the temperature in the baby's room at a level that feels comfortable to a lightly clothed adult and avoid overdressing the baby.